Blake is the owner of two franchises: SERVPRO of Kingsport / Bristol and SERVPRO of Abingdon / Bristol / Marion. He is very committed to achieving excellent customer relations through great service and exceeding our clients' expectations. Blake is very experienced and knowledgeable in the cleanup and restoration services industry holding many IICRC and other certifications. 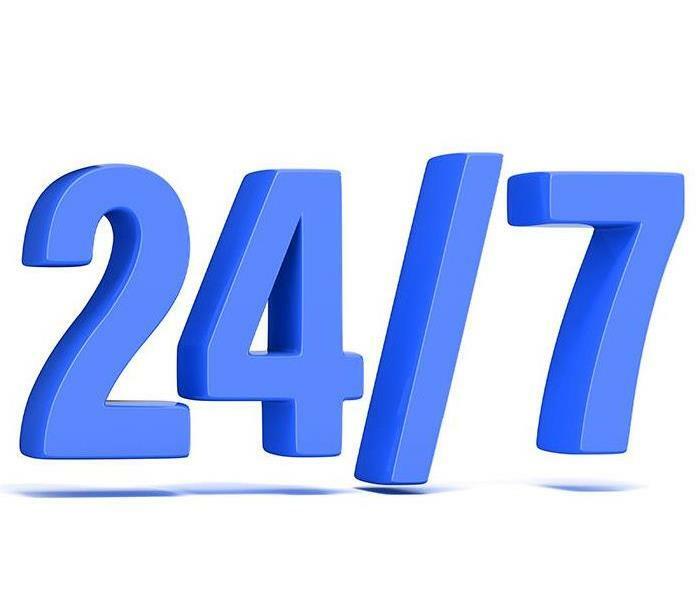 He is very hands-on and works many late hours with our crews on different types of jobs...fire & smoke and water damage restoration, mold remediation, biohazard, asbestos, and lead paint abatements. He enthusiastically supports our neighbors and communities and looks forward to helping all who are in need of advice and assistance. Rebecca is our Marketing Manager at SERVPRO of Kingsport / Bristol since 2012. She has had hands on experience, since about 2007, as an SRT, Fire & Smoke Restoration Technician, and the complimentary training as an Odor Control Technician, OCT. Rebecca has received the SERVPRO Carpet & Upholstery Certification, SERVPRO Water Restoration Certification, and SERVPRO Fire Restoration Certification. She is also certified in the best practices of the IICRC. This experience gives an added dimension to the detailed explanations she offers to prospective customers and current clients. Rebecca is armed with the Contractor Connection Mitigation Certification which expedites payments and cooperation with many insurance companies and adjusters. She networks and connects with community leaders and business to broaden our brand in the community. Rebecca brings a high degree of professionalism to all her clients and customers. Reach out to Rebecca by calling (423) 245-5552. Michael is our Commercial Marketing Representative at SERVPRO of Kingsport / Bristol. He has received the corporate and in-house ECTP, Employee Training Certification Program, and is well schooled in C.C. (Contractor Connection) Mitigation to control payments and cooperate with agencies and adjusters effectively. Michael has also received SERVPRO Carpet & Upholstery Certification, SERVPRO Water Restoration Certification, and SERVPRO Fire Restoration Certification. Michael offers the Emergency Ready Profile (ERP) to commercial clients and potential businesses. This mobile app can prevent and mitigate fire or water damage to an enterprise by having critical information at the finger tips. Michael has strong contacts with local business leaders and municipal and civic groups to expand our footprint in our service area. Contact Michael for information or estimates at (423) 245-5552. Caleb Phillips is a Production Manager at SERVPRO of Kingsport / Bristol. He has his Water Damage Restoration Technician certification from the Institute of Inspection Cleaning and Restoration Certification (IICRC). 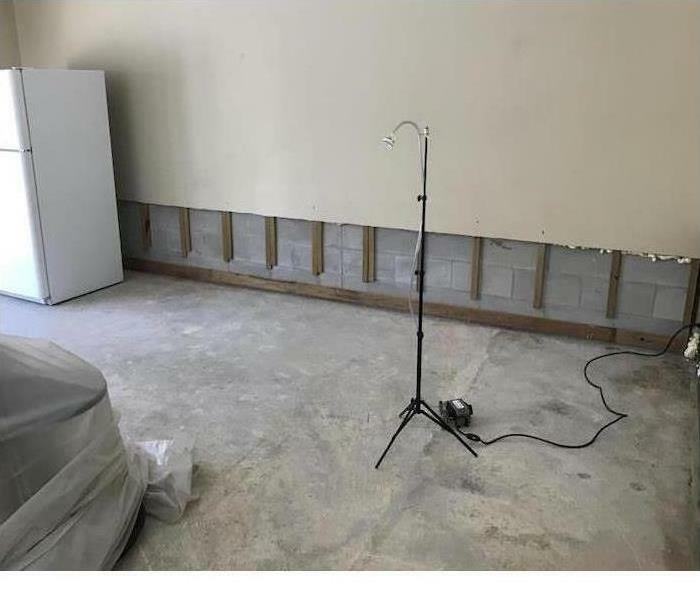 This course teaches technicians about water damage, techniques and effects for drying a structure, and understanding procedures on how to handle sewer backflows, water losses, and contamination due to mold. Caleb has his Asbestos Contractor/ Supervisor Certification from the Department of Environment & Conservation. 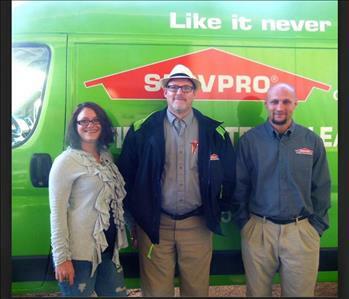 He has finished the Employee Certification Training Program at SERVPRO of Kingsport / Bristol. He has also completed Successful Subrogation and C.C. Mitigation Course. Caleb is a certified Commercial Applicator by the Tennessee Department of Agriculture. He has completed training in water damage restoration from SERVPRO. Caleb is an asset to SERVPRO of Kingsport / Bristol and our clients. Darby Cook is our Reconstruction Administrative Assistant at SERVPRO of Kingsport / Bristol. Darby completed the Successful Subrogation Course. This course teaches restoration contractors to avoid destroying subrogation potential following a loss, recognizing and taking measures to refine the subrogation recovery, to accurately document a scene, and classify and secure information that is crucial. She has also completed C.C. Roofing and C.C. Mitigation Course. 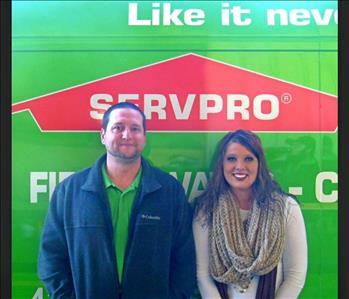 Darby has taken part in our Employee Certification Training Program at SERVPRO of Kingsport / Bristol. This is a voluntary program that provides information on Carpet & Upholstery Cleaning, Crew Training, Water Restoration, and Fire Restoration. As our Reconstruction Administrative Assistant, Darby is a valuable asset to our team at SERVPRO of Kingsport / Bristol. Greg is a Crew Leader at SERVPRO who uses his knowledge in Contractor Connection Mitigation, CC, and his comprehensive ECTP, employee certification training program to carry out scheduled commercial cleaning accounts even as he is running his crew. Greg is certified through the TN Department of Agriculture as a Commercial Applicator and uses this skill set when combating Black Water damage events. Tyler is a Technician at SERVPRO of Kingsport / Bristol who has excelled with the Employee Certification Training Program. Tyler has received the certification for the IICRC Water Damage Restoration Technician WRT. He is skilled in helping to restore fire & smoke and water damaged structures to preloss condition. He keeps the job site neat and clean and our customers happy. The Big Three for our Reconstruction Team includes Darby, Reconstruction Administrative Assistant, with all the tools for office support ranging from Successful Subrogation, refining recovery, through to documenting and securing pertinent information. Josh (on the right) who is our outstanding Reconstruction Project Manager with the skill set to work in unison with Michael Arnold our Reconstruction Manager to smoothly transition from project planning to completion seamlessly. These Three help drive the team to successful results and pleased customers. Our Sales & Marketing Team has two stellar personalities that shine in their networking with residential customers and commercial clients as well. Michael and Rebecca interface with local businesses, civic groups, and charities to increase our footprint in the SERVPRO tradition. They stress the use of the mobile app--ERP--Emergency Ready Profile to position our commercial clients with the tools to mitigate disruptions caused by for all natural disasters and infrastructure failures. Rebecca and Michael are stars that brighten up our entire team. Tonya is our Fire & Smoke Damage Crew Leader and is dedicated to customer satisfaction. Tonya spent most of her time previously pursuing a nursing career but helped us out part-time on large fire losses. Lucky for us, Tonya decided she wanted to change her path and become a dedicated full-time team member of our SERVPRO franchise. She is good at conveying the service steps to our customers, relieving their stress under difficult conditions, and to directing efficient crew efforts. Tonya is a first responder of sorts whether at a fire-damaged job site or helping with a pack-out and cleanup. Cindy is our Office Manager, and she oversees the day to day activities of our SERVPRO franchises. She handles all aspects of office staffing, our filing system and bookkeeping tasks that include billing, collections, and estimating. She has developed her technical skills to utilize SERVPRO's Corporate Proprietory software for Xactimate programs and also Quick Books Pro. Cindy's guidance provides for smooth interfacing between her office staff, ownership, management, and the production crews. She monitors customers for satisfaction and successfully directs any challenges that come her way. Cindy can be reached at (423) 245-5552. Mack is a water damage restoration technician (WRT) and has been contributing to our SERVPRO efforts since about 2011. He started out part-time and eventually decided this was a great fit for him; our attention to detail and customer satisfaction fitted well with past experiences of years of Army service. Mack loves to talk and interact with crew members and clients; he may also mention a few words about his "jacked up" vehicles.